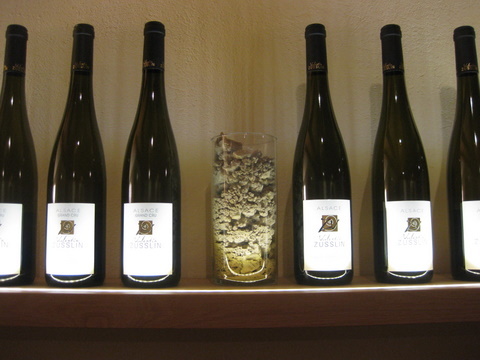 Alsace Wines – Dry, Off-dry, Semi-sweet or Sweet? Zat is ze question…and one that was debated at length yesterday at a conference put on by the Lycée Viticole in Rouffach entitled Grands Blancs d’Alsace: vins secs? Mythe ou nécessité? If you’ve ever been faced by a range of Alsace wines – in a wine maker’s cellar, on a supermarket shelf, on a wine list – you’ll know the problem. Your hand (or eye) hovers over that bottle of Riesling/Pinot Gris/Gewurz/Muscat/Pinot Blanc/Sylvaner and you wonder: will it be lip-smackingly dry with almost no residual sugar (RS), perfect for that piece of grilled turbot? Or off-dry yet perfectly balanced by firm acidity (Christophe Erhardt of Domaine Josmeyer has a nice descriptor for this kind of wine, calling it un vin d’esprit sec – kind of dry at heart but technically verging on sweet with some measurable RS) – just the ticket with a Catalan fish stew with saffron? Maybe it will be demi-sec with perceptible RS which (if the winemaker’s been doing his/her job properly) is sustained by the wine’s fruit and natural acidity, fine with foie gras or just the thing for a Moroccan tajine with quince? Or perhaps it’s properly, thrillingly sweet – but still balanced by that backbone of acidity – in which case it will be helpfully labelled either Vendanges Tardives or Sélection de Grains Nobles, best enjoyed on its own, outside the context of a meal with people you know will understand and share your joy in it, in a respectful atmosphere and without the slightest reference to its price. The difficulty (as outlined in a piece I wrote for Decanter way back in 2009 – which just shows how depressingly little progress has been made) is that you can tell very little from the label alone. Unless you’re bosom buddies with the wines of Alsace, the different grape varieties and the differing styles of wine making, chances are you won’t have a clue. As was acknowledged on all sides at yesterday’s conference, the Consumer is Confused. And what do Confused Consumers do, once they’ve plucked that Alsace bottle off the shelf or wine list, uncorked it, tasted it and found it wasn’t how they thought it was going to be? They declare that they “don’t like Alsace wines” (as if there was only one…) and they retreat into the arms of something boring, predictable and safe – generic Chardonnay, Sauvignon Blanc or, God forbid, Pinot Grigio. There was quite a bit of hand-wringing at the conference and we revisited the various solutions that have been offered over the years (adopt the four-way European norms of sec, demi-sec/moelleux/doux; add a sweetness scale on the back label (some growers already do this) etc. etc.). Whatever they decide that will help inform and educate the Confused Consumer who’s interested in Alsace wines but daunted by their sheer complexity and variety of styles and the lack of info on the label, it can’t come too soon. Far too many people, as panel-member Pascal Leonetti (sommelier at L’Auberge de l’Ill) lamented, are missing out on the treasures contained in the fabulous mine d’or (gold mine) of the fine wines of Alsace. Your article following this conference points to the crux of the Alsace wine: its identity, and benchmarks for the consumer. However, it is a recent problem, and hopefully limited in time. The look on the past brings provide points of reference. From the Middle Ages until the late 1980s and the “sugar driftage”, Alsace wine has always been a mostly dry wine: “almost dry”, “dry”, or occasionally “very dry”. It was in the 1980s that the driftage took place, with the abandonment of assemblies and the shift towards more residual sugar. Since that time, the Alsace wine does more out of this trap, and yet there is only one possible outcome. 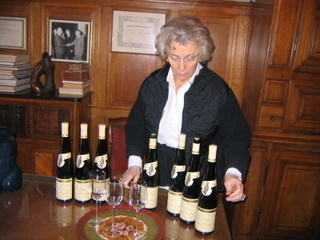 But before the situation was clear: The Alsace wine is dry or nearly dry, and the softer wines were late harvests wines. That’s it ! So, the “just” have to reinvent the famous Alsace Wine : Hugel’s “Gentil” is such a pure Alsace wine made by assemblies, and the result is there : more than 400 000 bottles of that wine are sold per year ! Thanks for your input on the sugar issue. It genuinely is a problem for the consumer and one we all hope will soon be resolved. I don’t think it’s so much that there’s been a general drift to sweetness, more that people don’t know what to expect from their bottle. And don’t let’s forget, some people prefer a little rondeur in their wines, as made by e.g. Pierre Gassmann of Rolly-Gassmann, while others appreciate the steely dryness of a Trimbach-style Riesling from Pierre Trimbach. For myself, I love the wines of both Pierres (in this, tiny, example) and would regret it if both did not continue to be made and marketed. But it’s OK for you and me, we’re familiar with these [very distinct] house styles and know what to expect. The point is, most consumers don’t – and I think they’d like to, are confused and then back off buying Alsace wines for fear of making a mistake. Salutations vineuses from sunny, snowy Alsace!